Thank you Simpledimple me for nominating me for the 3 Day Quote Challenge which I enthusiastically accept! 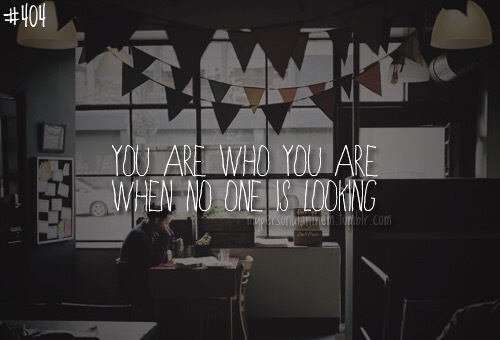 My quote today is ‘you are who you are when no one is looking’. This resonates with me because I feel strongly that the ‘real you’ cannot be hidden. People will eventually see through the facade and see the real person – warts and all! Save yourself the hassle and embrace the real you. The one that you hide away, thinking no one will understand or like. That’s the real you. That’s who you really are. If the real you is not who you would like to be, then make some changes. Improve you, for you. Then you will be at peace with yourself. I nominate Lovehappily for the 3 Day Quote Challenge too. Come back tomorrow for quote 2. Previous Post Lemons! What do we do with those lemons? I like this quote. Yes, we know who we are, and the real us can never be hidden. Thank you Nichole for nominating me for the 3-day challenge. I accept. Have a lovely weekend. Thank you for accepting the challenge. Have a great weekend! You are welcome. And you too. Hi Nichole, go to links on the icons where you make a draft post. Place your cursor where you want the Bloggers name mentioned. Click on the link icon, a dialogue box will appear, copy the Blogger’s URL, paste the URL on the box… Let me know if it works. I could send more info.